There’s something about the way flight sims conduct themselves that simultaneously alienates and entices the gamer. At once they seem too aloof to be considered entertainment, and yet so impossibly brimming with fastidious detail that – well, how could it not be entertaining? 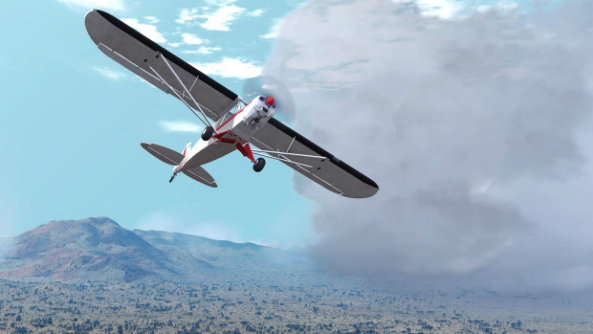 In the end, its the daunting scale of the flight sim’s proposition that whittles down its long-term audience, turning a cold shoulder to those who wanted to get a Cessna in the air without fifteen minutes of prior reading, but revealing a rich hobby that seems to transcend gaming to those prepared to put in the graft. 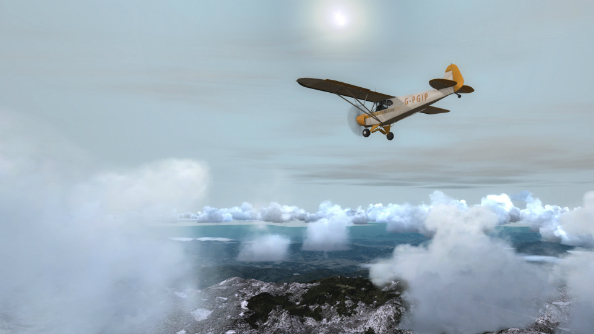 The world’s a blissful, combat-free place in Dovetail Flight School – for something to air your crosshairs at, try the best WW2 games on PC. And if playing a flight sim is sufficiently daunting that only a dedicated minority perseveres, what must it be like to develop one? To be tasked not just with understanding the physics model and controls, but implementing them in the first place? Stephen Hood, formerly creative director on Codemasters’ F1 series, knows exactly how it feels. 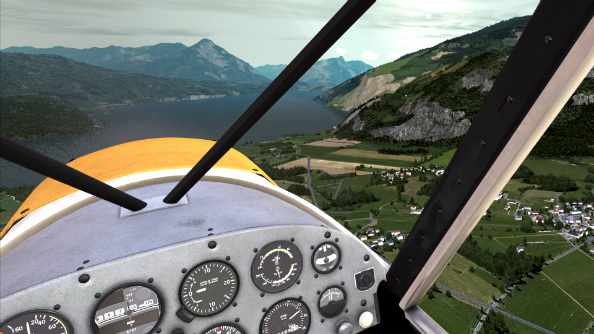 Now the creative director on Dovetail Flight School, he freely admits that flight sims haven’t been a lifelong passion but rather an occasional intererest. So, taking the role as creative director on Dovetail Flight School, itself a modern refresh of Microsoft’s Flight Simulator X’s nuts and bolts, Hood went method. He’s immersed himself in that world, he says. It’s a world that in reality is closed off to the majority behind a towering paywall, and as a result most people who pick up a flight sim don’t know how accurate the simulation model they’re dealing with really is. The same could be said of an F1 car, Hood’s previous preserve, too – but if you’ve ever strapped into a go-kart or attended a track day you can at least join the dots. That absence of like-for-like experience leads to some pretty banal activities sneaking their way into flight sims, like hoop flying. “I’ve never liked it,” says Hood. “I think one of the things I’ve tried to do is capture what it means to be there – in reality you don’t fly through hoops, you have an instructor who sits beside you, and waypoints on a GPS should you be allowed to use it. “I want to capture what it’s like to actually be there with an instructor. it’s not massively complex to fly an aircraft, I’ve done it. With hardly any training I’ve messed around on flight sim and I appreciate what it takes to fly an aircraft. The only difficulty I had was overcoming the fear of doing the thing for real and knowing that if I did mess up it would be goodnight for both of us, and that’s the stopper. If you have a passion for aeronautics, grounded only by fear and a light wallet, it stands to reason that piloting a pretend craft between endless floating rings isn’t going to satiate you. Dovetail Flight School isn’t intended simply as a flight sim, Hood tells me, but as a recreation of those first few flying lessons, aiming to capture the atmosphere of being with an instructor in the cockpit of a light aircraft. Beginning with the lessons you need to bag that light aircraft license, you’ll then hop the pond over to the states and earn your private pilot’s license, performing well-practiced manoeuvres in entirely new aircraft. It’s the sort of career fantasty Hood talks about inventing in his Microsoft Flight Sim 2004 days. Of course, for all the innovations it intends to bring, Dovetail Flight School won’t be a completely alien experience to most flight sim fans, because it bears so much of Microsoft Flight Simulator X’s DNA. For those who didn’t follow the story, Dovetail bought the rights to the beloved and beleaguered 2006 IP, using it as a starting point for a new generation of sim. “We are building out from the foundations of FSX’s original flight sim technology,” explains Hood. “We did that because FSX was the last simulator from Microsoft that had many of the components that I believe were fundamental to the principle of flying or being a pilot. 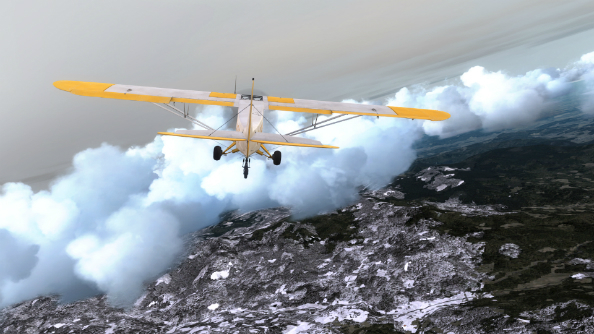 It puts Dovetail Flight School, as Hood sees it, a leap ahead of other flight sims who have to begin from scratch, rather than using the foundations of one of the best examples the genre has enjoyed in the past decade – albeit right at the beginning of it.